A leaky rear damper and a bunch of knock-on jobs. While I was sorting out the new rear brake lines I noticed the outside of the rear driver's side damper was wet. I ket an eye on it and it kept getting wet meaning a leak, not pouring out but enough to need sorting. The rear dampers are an exchange unit so you have to send back your old units to the supplier of the new ones to reclaim the surcharge. This was a bit of a pain as it was impossible to free up the dampers from the drop-links while on the car. Annoyingly it was the same story on the drop-link to base-plate joints. This meant I'd end up removing the whole assembly rather than just the dampers. So, while I was doing that I might as well replace the rubber pads which bracket the springs. Ok, but then I need to remove the U-bolts, which means I'll also need to remove the bump-stop pads. So that's everything coming off the rear suspension apart from the springs themselves - and no way was I going to tackle the spring eyes right now - they looked like a mini-project all by themselves. The damper bolts in the wheel wells had survived well under the underseal - showing yellow paint once the initial seal cracked on the bolts. They did however take a massive amount of effort to undo. 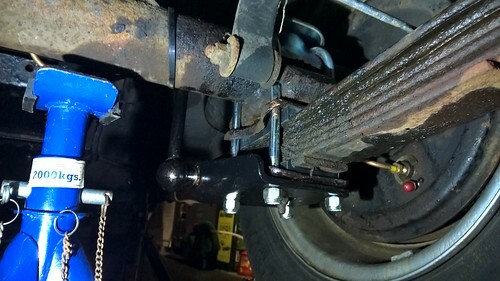 The replacement of the various bits was straightforward, the most difficult thing being where to place the jack and stands so the weight of the rear axle was supported and the springs dropped just enough. One thing to watch is not to tighten the drop-link connections until the car is back on the ground as it could stress the bushes. Once it was all back together - including torquing up the new damper bolts - a couple of trips produced squeaking from the rear which was the u-bolts not being tight enough, so a couple of further tightenings sorted that out. The final thing was to pull the old assemblies apart so I could return the appropriate bits - in the end I had to resort to a blow torch, something I couldn't have done in-situ due to access and the adjacent fuel lines.